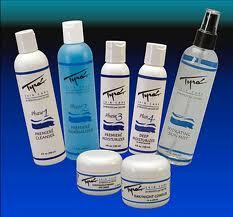 The Tyra Skin Care line is one whose main concern is to rehydrate your skin to create a beautiful complexion. A much loved product collection for more than 20 years, the Tyra line is devoted to helping its customers achieve a stunning skin complexion and educating them about the extensive benefits that something as simple as water can have for your skin. Originally launched to the public through cosmetic counters at Marshal Field’s’ stores, the Tyra line has been working its magic on women since 1988. The current product line is the result of more than 45 years of extensive work and research and is the brainchild of William D. Soma, famous for creating makeup for big name clients such as Universal Studios. Soma’s main goal was to create high quality products that anyone could use that would help to relieve the symptoms of excessively dry skin while also working to reverse it. Keeping this goal in mind, Soma used his extensive education and resources to begin work on the miracle that would become Tyra Skin Care. After years of extensive research, chemistry testing and human testing the company launched its first patented product – Plus IV Deep Moisturizer, the product that would win over the hearts of millions of women and put mark them as contenders in the skin care industry. The company is quite forward about the fact that what they are offering you is not a quick miracle fix. What they are offering you is a product that utilizes gentle and effective ingredients to not only aid your skin in absorbing moisture but to flush the skin with moisture – producing healthy, supple, well hydrated skin. While this produce is a God-send for many who suffer from excessively dry skin, the products included in this line can be used by virtually anyone who is looking to create healthier skin, avoid seasonal dryness or to prevent dry, damaged skin altogether. A small line by design, Tyra is a daily four-step regimen whose products work best when used together as directed. The first product that you will use for your daily Tyra regimen is the Premier Cleanser which effectively which cleans the skin and gently strips away toxins and pollutants without damaging or over-drying the skin. The cleanser also removes dead and dry skin cells from the surface while also protecting outer cell layers with a cleanser that is completely water soluble and skin friendly. The next step in the Tyra regimen is to use their effective Normalizer treatment. This product’s main goal is to return the skin to a state of natural balance and pH measure which essentially allows it to protect itself against harmful bacteria. The contents of this product also aid the skin in moisture reception which helps it to prepare for the next step. The third product in the Tyra system is their Premiere Moisturizer, which is responsible for rebuilding a lipid layer on the surface of the skin, which will prevent excessive moisture from being evaporated by the sun and heat throughout your day. This product is also effective in softening wrinkles making them less noticeable. The last and most important product you will use in the Tyra Skin Care regimen is the Deep IV Moisturizer which has ingredients that not only promote absorption but that flood the skin with additional moisture to hydrate your skin and create an instantly healthier complexion that is continually improved with use over time. A praised and patented product line, Tyra Skin Care products are both effective and affordable for anyone who would like to try them. These products are available exclusively through certain local retailers and through various sites online so visit a local retailer to purchase this incredible system and begin benefiting from skin hydration today.